No, not Ferris Bueller, Buell Mountain in the Moose River Plains. On Thursday, I had the day off, and the weather was calling for no clouds, so I put out a mention on the Adirondack High Peaks forum saying I was going hiking, and TBPDPTI said he would go. The original plan was to once again try for Brown Pond, Panther, and Buell mountains. But I had left my guide book, The Other 54, at home that mentions an old logging camp on the way to Brown Pond. Seeing as I needed it for directions/distance, the plan instead became to go to Buell first, then Panther, then Brown Pond, since we would be able to cut the day short depending on time. I arrived at Wakely Dam, our meeting point, and who do I see checking it out, none other than Andy Arthur, of AndyArthur.org, another good website for outdoor adventures. Daniel arrived a few minutes after I did. As we were getting ready, I went over the different ideas I had of how to go. The plan ended up being to follow the snowmobile trail from the dam for a little bit before breaking off into the woods. Once we were loaded up, we headed off around the gate and down the trail. After about 1/2 mile, Dan spotted an old tote trail off the right side, and it was about where we were going to break off so we started down it. Came across a well built beaver dam, the trail/road we were on actually was lower than the surface of the pond it had created with it’s dam building. And soon after that, a large marsh area, that we were planning on going around, but happened to notice an animal trail going through, so the choice was made to see if we also could go across. About two hours after starting we had reached Buell Brook, and took a break. Once break time was over, it was onto the serious climbing of the day. Over 1200′ to reach the summit of Buell. It was mostly easy bushwhacking, only a few spots where we had to stop and look to see what direction to get around things. After about 4.5 hours, we reached the summit. The summit has three bumps in a 100 foot diameter. The coordinate I found online, pointed to one that appeared a couple feet shorter than the one we choose as the summit, since it had the most signs of activity on it. Set up my chair, and got my summit picture. Based on time, we opted instead to head back. 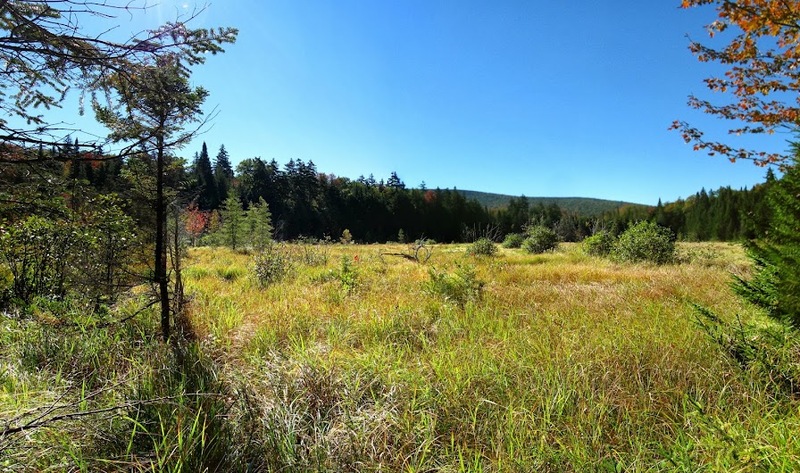 I’d read about a hunting camp along Buell Brook, thinking there may be more old roads from there back to Wakely, we picked a direction which should get us down almost in line with it. Along the way down, we came across a creek bed, that this picture does not do it justice. It looks so much better in person. The creek took us right down to the camp. Hard to say when the last time someone was there. The grass has grown up around the two buildings, but not so much that you can’t picture someone still going up each year. A little bit away from the camp, we did find another logging road that was heading in the right direction, back towards Wakely and our path in that morning. Nice hiking with you buddy!